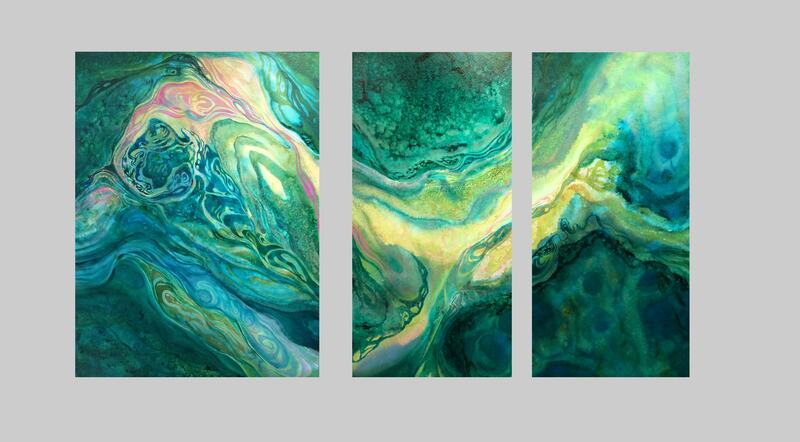 Another large triptych in the Currents & Eddies series. I may not post my painting for the 30-paintings-in-30-days challenge until this evening, or maybe tomorrow. While the first few days of the challenge have been going on, I’ve also been completing this second large triptych for Lakeview Hospital in Stillwater, MN. The three panels are 24×18″, 24×12″ and 24×12″. Both triptychs are for the surgery area. This one will hang across from the registration desk and the larger one that I posted earlier will be at the entrance to the surgery area itself. The panels for the larger triptych are 30×30″, 30×10″ and 30×10″. Both paintings are now in the drying/curing stage before isolation coat and varnish.